See how fun it is!! Beer Bike is a none poluent activity that exists on almost world capitals, it combines cycling with fun. Our Beer Bike as capacity for 15 persons plus 3 of the team crew persons, including the crew. As our clients are enjoying the landscape of Vila da Santa Maria, allways cycling of course, our bar tender will suit you with a nice cold beer, taken from the beer pressure machine, with the music chosen by us or brought by our clients. Our clients can also use our wi-fi network to share their selfies or live videos. The Tour start, takes place at Hotels Avenue and takes about 90 to 120 minutes, it depends of the clients cycling rythm. Our clients can enjoy 1L beer each and then at the end finishing with very good typical dish from Cape Verde gastronomy - Cachupa or a Seafood dinner!! During the Tour, the clients have all the necessary security, with a speed between 8/10kmh, seats with back rest, security belts, arms and feet rest and also seats for cycling or resting. It will be for sure one morning, afternoon or evening with a lots of fun and chat, above all one different way to visit the village. 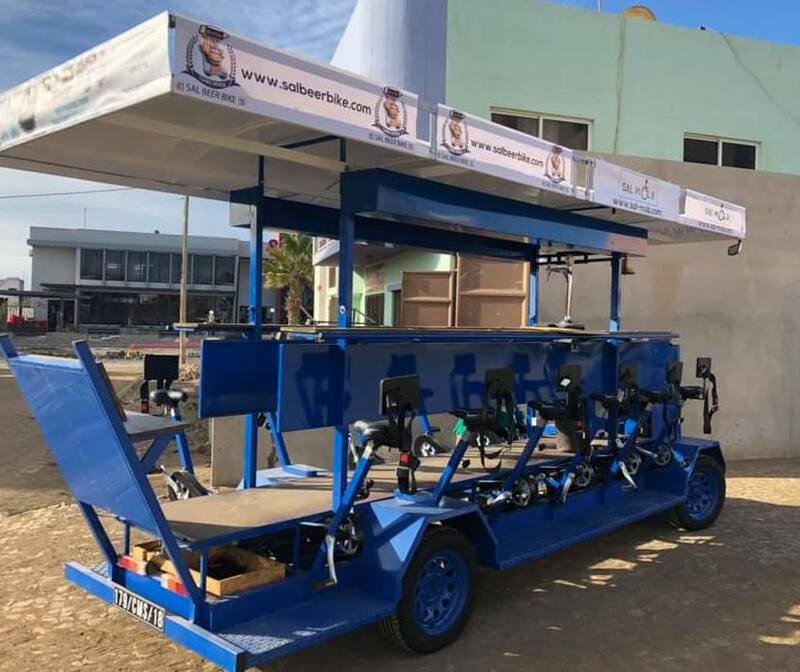 Our beer bike is the last model in town, its so easy to use as drinking a beer and have lots of fun, check it out. Just relax, sit back, put your feets in the pedals, hands on beer and here we go!! You should remain seated during the whole ride unless the driver tell you to stand up. Jumping down during the ride is dangerous and can cause an accident. Chat and singing is allowed but please avoid screaming and yelling, as well harassing other persons and other traffic locals. We have toilette break points just in case some one needs, therefore is not allow and it’s at the same time prohibited to pee in public. Is strictly forbidden throwing cigarette butts, papers or other garbage types, please use the bin and ashtray provided. We do not serve alcohol to anyone under 18 years old. The driver can require ID to check your age. You are also forbidden to bring your own drinks to our Beer Bike. Our driver can stop serving alcohol to people he conciders too drunk to be able to behave safely during the tour. The driver can also interrupt the tour if you become unpleasant for the participants or for the public. Select the respective day and then the respective Pack you want, fill your information, name, e-mail and telephone. If you want to book more than 1 seat, please do this steps with the respective persons informations, each Beer Bike tour takes only 15 persons. After booking, you will receive an e-mail confirmation with the details. For more informations please contact us or your agency travel or at the hotel receptions. We are a company with some experienced years in the market, based in Santa Maria - Sal Island - Cape Verde.